This fixture measures 16" across and is made of cast aluminum. 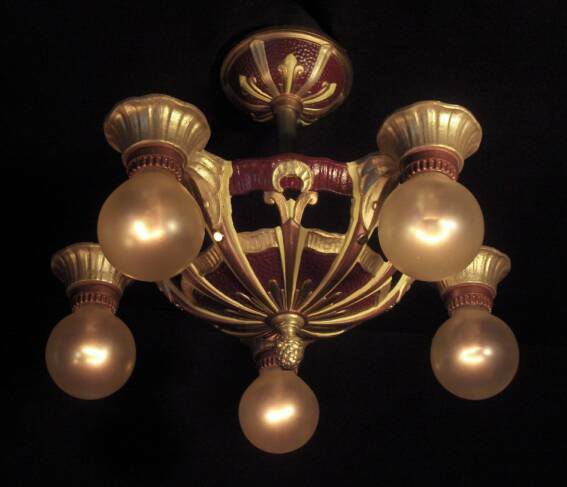 Period correct reproduction frosted bulbs are not included, but are available at fixture purchase. This is a Complete Restoration. *Free ground shipping in the continental US only. 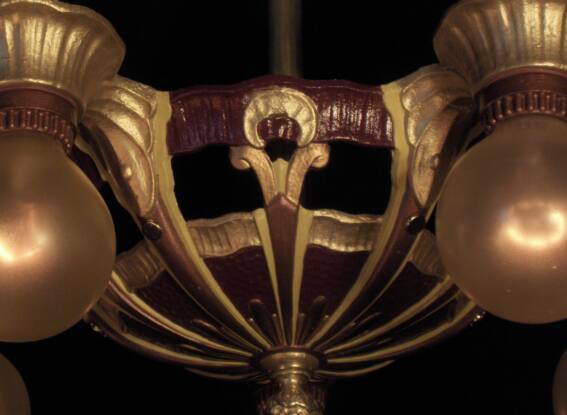 Each of our complete restorations have been stripped to bare metal by bead-blasting, sealed in primer, then hand finished to complement Victorian, Art Deco, and Art Nouveau period interiors. All wiring and sockets have been replaced with new quality parts for your safety. The fixtures come ready to hang with new mounting hardware. When the original finish can be saved, we refurbish the fixture or fan. We replace all wiring and sockets with new quality parts while retaining the original patina. New mounting hardware and bulbs are included on light fixtures. Please call (209) 810-9973 to have your credit card order securely processed over the phone. Please reserve the next fixture for me.